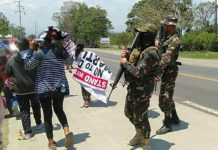 ZAMBOANGA CITY (MindaNews / 12 September) – Moro National Liberation Front (MNLF) Commander Ustadz Abdulhabier Malik declared that the MNLF will release the more or less 200 civilians they held hostage since last Monday only after negotiations have been set with the local government of Zamboanga City. Speaking through a local broadcast station, Malik stressed that there is a need to discuss settlement for peace first before they will release the hostage victims. One of the hostages, Catholic priest Fr. 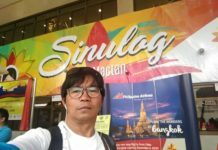 Michael Ufana, who was allowed to speak on air, disclosed that while the MNLF are “willing to release the 200 hostages,” there is a need to place “on the table cosa el problema” (what the problem is), and that the matter is now in the hands of Zamboanga City Mayor Beng Climaco. Malik assured the safety of personnel and volunteers of the Red Cross and other socio-civic organization volunteers who are delivering food to the hostages or providing medical assistance. Earlier, MNLF founder Nurulaji Misuari declared that he as the ruling chairman of the MNLF has no knowledge and control over the actions of Malik, who is known to be among the organization’s staunch warfare leaders. Malik some years back held hostage then government peace panel member Maj. Gen. Benjamin Dolorfino and 14 others in his Bitanag camp in Panamao, Sulu. 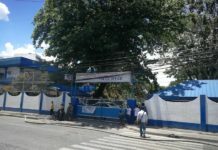 Last Monday, the MNLF sent a message to media that it seeks to declare independence as a Bangsamoro state, and presents three demands: to be provided a place where they may be given refuge, to be issued a government permit to march and conduct their peace rally in the commercial center of Zamboanga, along with the hostages, and for their representatives to meet with Mayor Climaco. In a phone interview with John Petalcorin, who claimed to be the MNLF director for advocacy and campaign, said that “there are counterfeit MNLF members doing war games with the intention to close the talks” on the details on the implementation of the 1996 peace accord. Petalcorin further said that Misuari is “presently guarded by sufficient number of armed men” providing him security in a safe place that the MNLF will disclose in due time. The MNLF since their entry to Zamboanga has occupied six barangays to include Sta. Barbara, Mariki, Talon-Talon, Sta. Catalina, and Rio Hondo; burned buildings in Sta. Barbara; held 200 hostages; and exchanged fires with city cops, Navy SEALs of the Naval Special Operations Unit, Task Force Zamboanga, and the Marine Battalion Landing Team 3. The conflict caused the displacement of about 12,907 residents who are now temporarily accommodated in five evacuation centers, mainly the Joaquin Enriquez Memorial Sports Complex, Tetuan Central School, and the St. Ignatius Parish. All patients from the Zamboanga City Medical Center, meanwhile, have been evacuated and are temporarily housed in the Western Mindanao State University Gymnasium, Zamboanga Sanitarium, the Edwin Andrews Air Base Hospital, and the Harmony Village. At past 8 a.m. today, MNLF rebels in Lamitan attacked Barangay Campo Uno, where three troopers of the Philippine Army’s Scout Ranger Battalion were wounded. On Tuesday evening, blasts were reported in Baunoh, Bangkal, Patikul and Kilometer 2 in Indanan, Sulu but the police there said no one was hurt.